Prepping healthy meals ahead of time can help you stick to your nutrition goals and save you time during the week. 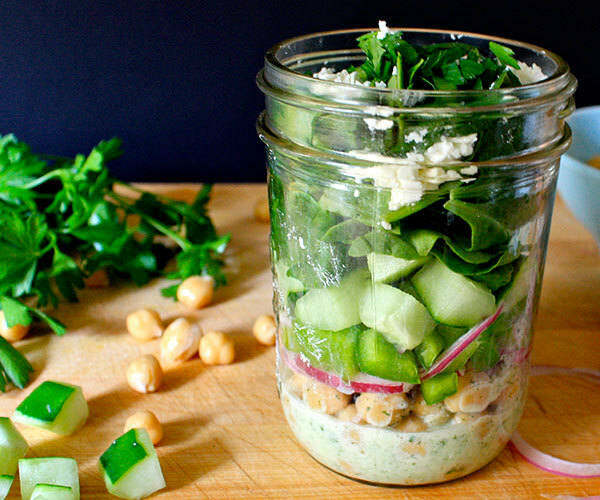 A Mason jar salad is made for meal prepping. 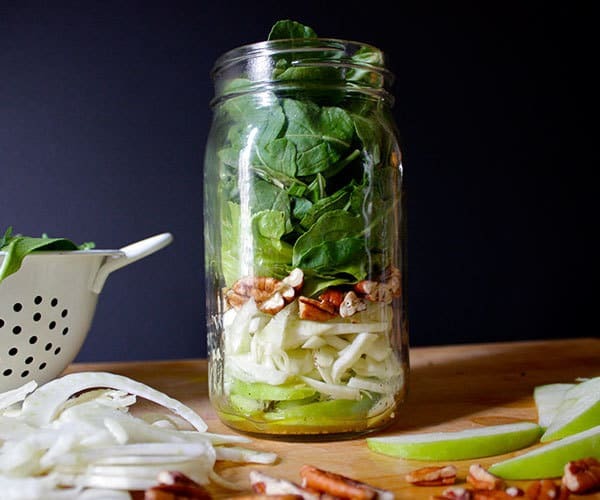 Mason jar salads are super easy to put together and super practical: Since the dressing is at the bottom of the jar, and the greens are at the top, your salad won’t get soggy. Even better? These salads are totally customizable. We created these 5 simple Mason jar salad recipes for you, but you can use them as templates and swap in/out ingredients as you wish. 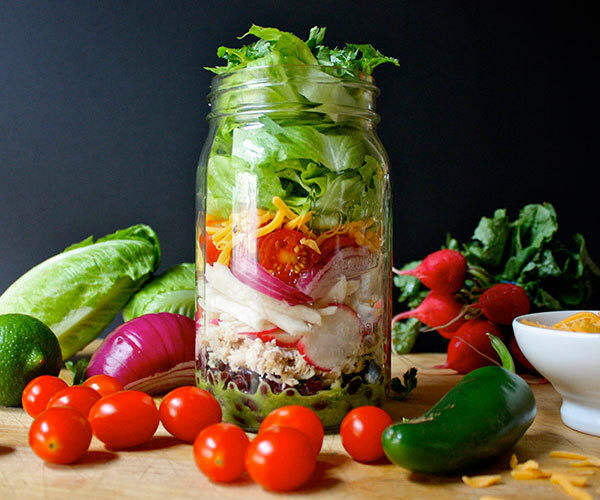 The secret to a perfect Mason jar salad is layering in the proper order. The first ingredients you add are what create the barrier between the dressing and the lettuce, so add hearty ingredients that won’t soak up the liquid such as carrots, peppers, or beans. Pour the dressing in first to coat the bottom of the jar. Dressings like a vinaigrette work best; thick, creamy dressings can stick to the jar and make it harder to mix with your other ingredients. Remove as much moisture as possible from washed lettuce to prevent wilting. 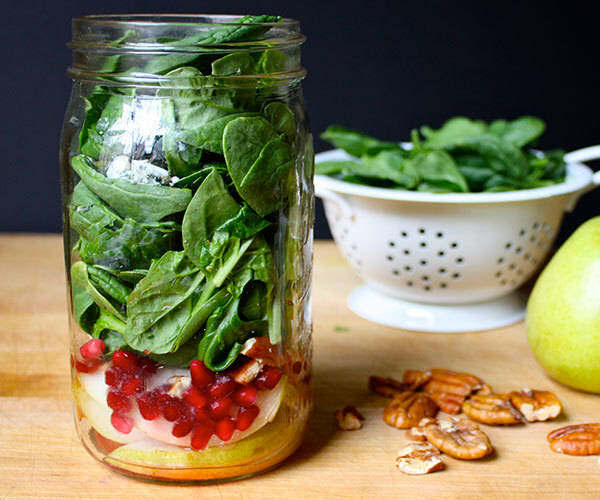 Pack your arugula, spinach, or other greens at the top of the jar. You’ll be surprised at how much you can fit in the small space! When storing or transporting, keep jars upright to prevent the dressing from reaching the greens. When you’re ready to eat, just shake up your jar and then pour everything into a bowl and enjoy. 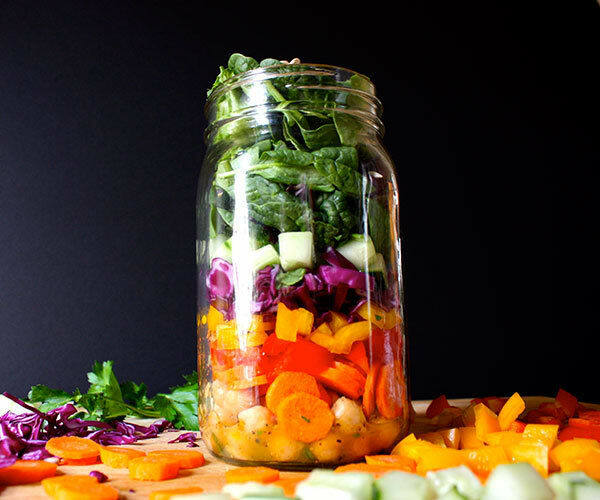 Nutrition experts advise people to “eat the rainbow!” and this Mason jar salad is the perfect way to do it. You’ll be literally eating a rainbow of bright red and yellow bell peppers, red cabbage, carrots, cucumbers, garbanzo beans, and vibrant greens. Topping it off is a zesty white balsamic vinegar dressing that’s tart and refreshing. This salad is brimming with all of the colorful ingredients you desire in a burrito, and like a burrito, it comes in its own perfectly portable package. But the dressing is the real star — it features fresh lime juice, cilantro, a whole seeded jalapeño, garlic, and cilantro. Get the recipe. If you love blue cheese as much as we do, you’ll love this simple salad made with pears, toasted pecans, and pomegranate seeds. Can’t find pomegranate seeds? Substitute them with dried cranberries. Get the recipe. This sweet and hearty apple fennel salad gets its crunchiness from sweet apples, fennel, and toasted pecans. This salad is a perfect make-ahead salad that’s easy to take to the office or when you’re on the go. Pro tip: Soak the apple slices in salted water to keep them from turning brown and help them stay crisp. You’ll love the combination of chickpeas, crisp bell pepper, and refreshing cucumber in this Mediterranean salad. A creamy yogurt dressing with fresh mint and garlic brings it all together and feta and parsley add the finishing touches. Get the recipe.